AIRTEC Motorsport Downpipe for the Ford Focus ST225. Kit includes :-. Designed and finished in the UK. Made to a high quality standard and all tubing is finished in brushed stainless steel. This part will fit the Fiesta 1.0 EcoBoost, ST180, ST200 & Fiesta ST150. AIRTEC part no: ATMSFO20. THIS KIT IS FOR THE YELLOW BUSH! 2 x Polyurethane bush inserts. Replaces original ford cast alloy and rubber torque mount. If you fit a decat or high flow sports catalyst to your car, you could run the risk of having an engine light turn on. ND-Tuning accept no liability for any incorrectly fitted parts. AIRTEC MOTORSPORT DE-CAT DOWNPIPE FOR FIESTA MK6 TDCI. AIRTEC Motorsport de-cat downpipe for the Fiesta MK6 TDCI. Developed and tested in house at AIRTEC HQ, this product is essential for MK6 TDCI owners wanting the maximum power from the OE turbo. Airtec Motorsport Downpipe includes :-. KA27, KA28, KW1-KW3, KW5-KW17, PA20-PA39, PA40-PA49, PA60-PA78, PH1, PH5-PH9, PH10, PH15-PH26, PH30-PH44, PH49-PH50, ZE1-ZE3. FK19-FK21, HS1-HS9, IV1-IV28, IV30-IV32, IV36, IV40-IV49, IV51-IV56, IV36. AIRTEC Motorsport Induction Kit for the Golf R MK7. made with love by. AIRTEC Motorsport Induction Hose to suit Airtec Induction kit ( ATIKVAG23). Will fit the following vehicles when fitted with Airtec Induction kit. Add to Favourites. Audi S3 (8V) 2.0 TSI. Audi A3 (8V) 1.8/2.0 TSI. AIRTEC Motorsport Induction Kit for the AUDI S3 8V. made with love by. Fits Focus MK2 RS & ST and Focus MK3 ST. CNC from solid billet alloy, bead blasted and anodised in satin Black. 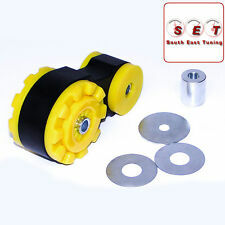 Replaces original ford cast alloy and rubber torque mount. Testing of new components is carried out both on the vehicle and on test rigs. AIRTEC Part No: ATMSVAG1. CNC machined and finished in pro-series black finish the muffler delete is designed for increased throttle response, smoother air flow and enhanced turbo noise. FK19-FK21, HS1-HS9, IV1-IV28, IV30-IV32, IV36, IV40-IV49, IV51-IV56, IV36. Part Number: ATEXHFO5. Airtec Motorsport downpipe de-cat for Focus MK3 ST250 The Original Catalyst and down pipe, unlike the older ST225 and Focus RS mk2, are made in one piece. Upon receipt of your order you will be asked to sign for the goods received in good condition. AIRTEC Stage 2 Seat Leon K1 2.0 TFSi Uprated Intercooler- HUGE 55mm CORE! Available in stealth black ! Also available with or without Airtec logo. HUGE 55mm CORE! - 64mm INLETS. Tests showed an intake temperature of 31 degrees @ 249.5bhp ‘ Temp drop of 18 degrees & 12.8bhp Gain, compared to standard VAG Intercooler! Available in stealth black or polished alloy! Also available with or without Airtec logo. Airtec Intercooler 60mm core - Peak power 233.3.0 bhp & 190.5 Ib/ft. First R53 of the shelf Intercooler to have. AIRTEC Stage 2 Audi S3 2.0 TFSi Uprated Intercooler- HUGE 55mm CORE! High flow downpipe. High flow De-cat. Made to a high quality standard and all tubing is finished in brushed stainless steel. Designed and finished in the UK. We give a 1 year warranty on all goods unless otherwise stated - such as ex-demo item which may only have 3 or 6 month warranties. Also available with or without Airtec logo in black, red, white or blue. The new ST Fiesta is a great car and why not make it even better and fit the best, fit AIRTEC. AIRTEC Front mount Intercooler Features. AIRTEC Vauxhall Corsa VXR Uprated Front Mount Intercooler - HUGE 80mm Core! Also available with or without Airtec logo in black, red, white, blue or yellow. AIRTEC Front mount Intercooler kit Includes these parts & Features. Airtec 3 year unlimited mileage warranty. Powder coated standard intercooler support brackets. Will work perfect with standard or re-mapped Fiesta ST's. 52mm pipe throughout, compared to the restrictive 42mm resonated standard pipe. Fits Fiesta MK5, MK6, MK7 and Ford B-Max. 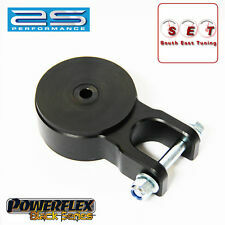 Replaces original ford cast alloy and rubber torque mount. Testing of new components is carried out both on the vehicle and on test rigs. Part Number: ATEXHFO6. 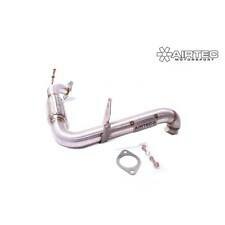 AIRTEC Motorsport downpipe de-cat for Focus MK3 RS. The Original Catalyst and down pipe, unlike the older ST225 and Focus RS mk2, are made in one piece. Upon receipt of your order you will be asked to sign for the goods received in good condition. However with this kit, we include a mil-light cheater installed, so you can plug your lambda sensor back in which "shouldn't" bring on the check engine light. Expect more popping & deeper aggresive exhaust sound. Part Number: ATEXHFO9. AIRTEC Motorsport 3.5" downpipe for Focus MK2 ST/RS. - Downpipe locking bolts. Upon receipt of your order you will be asked to sign for the goods received in good condition. Failure to do so may affect any warranty claims that you make there after. 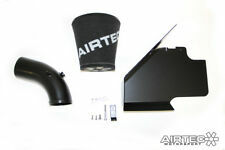 AIRTEC MINI COOPER S R53 Alloy Uprated Top Mount Intercooler WITH Snoot Boots! Available in stealth black or polished alloy! Also available with or without Airtec logo. Airtec Intercooler 60mm core - Peak power 233.3.0 bhp & 190.5 Ib/ft. SNOOT BOOTS ARE AVAILABLE IN THE FOLLOWING COLOURS. 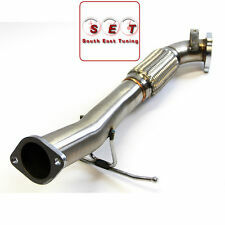 Ford Fiesta St180 Airtec Decat Exhaust Pipe. In good Used condition. Decat was on my St180 for just over 2 months before i took it off the car to sell it. This is a great addition to the St180 especially if your are planning a stage 2 or 3 ecu map. This decat pipe will fit a standard cat back exhaust system or an aftermarket one. Dispatched with Royal Mail 2nd Class. AIRTEC Motorsport Downpipe for the Ford Focus RS MK2. Kit includes :-. Designed and finished in the UK. Made to a high quality standard and all tubing is finished in brushed stainless steel. AUTHORISED AIRTEC DEALER. 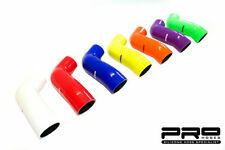 AIRTEC Motorsport downpipe de-cat for Focus MK3 RS. The Original Catalyst and down pipe, unlike the older ST225 and Focus RS mk2, are made in one piece. Channel Islands, BT, most IV, HS, KA-27-28, KW-15-17, AB30-56, FK17-99, G83, KW1-14, PA21-40, PH18-26, PH30-41, PH49-50, all ZE, IM. Airtec Motorsport high flow downpipe and De-cat Focus ST225 Mk2. However with this kit, we include a mil-light cheater installed, so you can plug your lambda sensor back in which "shouldn't" bring on the check engine light. Will work perfect with standard or re-mapped Fiesta ST's. 52mm pipe throughout, compared to the restrictive 42mm resonated standard pipe. Fitting takes less than 30 minutes to install and fits to standard boost hoses. However with this kit, we include a mil-light cheater installed, so you can plug your lambda sensor back in which "shouldn't" bring on the check engine light. We cannot be held responsible if the product is not suitable for use outside the UK. We cannot be held responsible if the product is not suitable for use outside the UK. We give a 1 year warranty on all goods unless otherwise stated - such as ex-demo item which may only have 3 or 6 month warranties. However with this kit, we include a mil-light cheater installed, so you can plug your lambda sensor back in which "shouldn't" bring on the check engine light. Expect more popping & deeper aggresive exhaust sound. Gain 10bhp (depends on spec of your car). 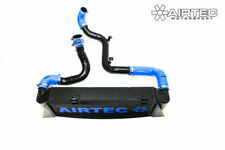 AIRTEC huge front mount intercooler for Mk3 Focus RS. The AIRTEC intercooler is the only off the shelf intercooler that uses a 100mm deep core! 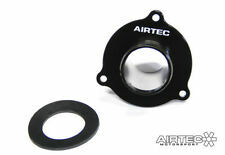 AIRTEC Intercooler Logo. WITHOUT AIRTEC Logo - Plain. Black AIRTEC Logo. Pipework finish. The 2.5" big boost pipe kit is a must for all remapped RSs, Everything you need is included in the kit. 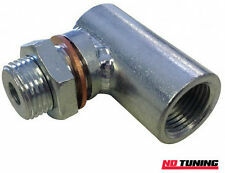 Our 2.5" hard pipe upgrade removes Ford's 2.0" restrictive boost pipes. We saw gains of 11.8 bhp & 9 lb/ft torque increases over the standard Ford pipes and these gains were achieved by simply bolting on the kit. Airtec Smart Fortwo 451. As fitted to the Smarts 4 You race cars this intercooler is a great upgrade to any standard or remapped Smart car. AIRTEC Logo. Black intercooler - White logo. Black logo - Silver intercooler. AIRTEC Motorsport induction pipe for the Focus MK3 RS. High flow crossover pipe designed to help increase airflow, available in pro series satin black. In this case you will also be required to complete a short missing item form to verify that the item has not arrived. AIRTEC Motorsport induction pipe for the Focus MK3 RS. 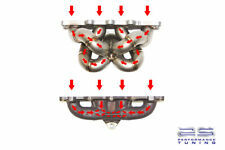 High flow crossover pipe designed to help increase airflow, available in pro series polished silver. In this case you will also be required to complete a short missing item form to verify that the item has not arrived. Expect more popping & deeper aggresive exhaust sound. Gain 10bhp (depends on spec of your car). We give a 1 year warranty on all goods unless otherwise stated - such as ex-demo item which may only have 3 or 6 month warranties. Expect more popping & deeper aggresive exhaust sound. Gain 10bhp (depends on spec of your car). Allows exhaust gases to flow much faster, More power! Removed your dump valve?. you'll need one of these. KA27, KA28, KW1-KW3, KW5-KW17, PA20-PA39, PA40-PA49, PA60-PA78, PH1, PH5-PH9, PH10, PH15-PH26, PH30-PH44, PH49-PH50, ZE1-ZE3. FK19-FK21, HS1-HS9, IV1-IV28, IV30-IV32, IV36, IV40-IV49, IV51-IV56, IV36. AIRTEC Motorsport Induction Kit for the MK3 Skoda Octavia VRS 2.0 Turbo. made with love by.